The Eagle Rock Basin, the smallest of the four ULARA groundwater basins, lies in the southeast corner of ULARA. 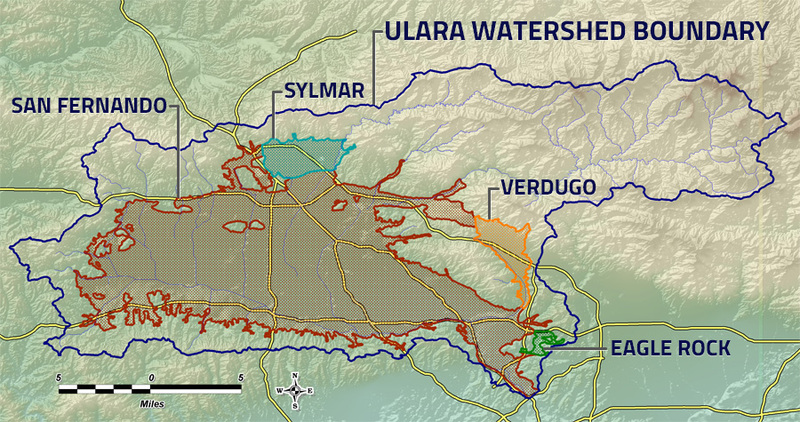 It consists of only 800 acres and comprises 0.6 percent of the total valley fill in ULARA. The Eagle Rock Basin has only a very small native safe yield. Los Angeles delivers imported water to lands overlying this basin, and return flow from this delivered water is considered to constitute the majority of the safe yield of the basin. Even Though Los Angeles has the right to extract, or allow to be extracted, the entire safe yield of Eagle Rock Basin, this city does not extract any groundwater from this basin. DS Waters (successor to Sparkletts and Deep Rock) has a physical solution right to extract groundwater to supply its bottled drinking water requirements, pursuant to Section 9.2.1 of the Judgment.